The United States has three main termite types that cause damage, but here in the Southwest, the most common and costly is the Subterranean termite. Like their name says, this termite lives underground, hence the ‘subterranean’ in their name. Made up of three levels (castes), a termite colony consists of workers, soldiers, and reproductives, and the colonies typically range in size between 60,000 and 1 million termites. Most of the time these termites will not live in the structure (your home) they’ve invaded, but travel up from underground into your home, looking for more cellulose material to bring back to the colony. On rare occasions, where conditions are just right for the subterranean termites, they can live in the structure, but this typically requires excessively moist/wet and damaged/decaying wood, lots of humidity, and several other factors. Subterranean termites are also the most common type in the United States. This termite will colonize in wood material above ground. Not especially common here in Arizona, the best method of control for these termites is still fumigation. When you see a house covered in one of those huge tents, that home is being fumigated for drywood termites. These termites are able to survive off the moisture contained in the wood material where they build their galleries. Again, Drywood termites aren’t too common in the Phoenix-Metro area, but we know how to spot them. 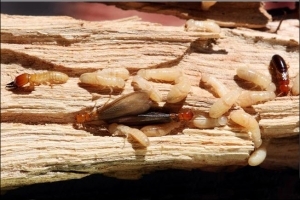 Even more uncommon in the Phoenix-Metro, this termite lives in damp and decaying wood, and requires contact with water and very high humidity to survive. The best defense against termite damage is a good offense, mainly, your own eyes. What you should look for are the small, sandy mud tubes the termites build and travel within. Check around the foundation of your home – if you see a sandy-looking ‘vein’ going from the soil up to the stucco/siding, it’s probably termites. Have a weird, sandy-colored ‘stalactite’ looking thing hanging down from your ceiling? Yep, termites. 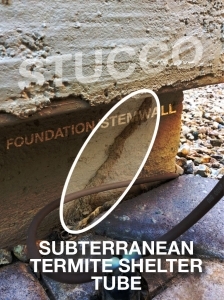 Subterranean termites can enter your home through a crack as small as 1/32 of an inch, and they usually get in through expansion joints in the concrete, through cracks in the foundation, where plumbing comes through the foundation, inside hollow block walls, and along the foundation. If you want to know for sure if your home has termites, we’d be happy to have our certified termite inspector come out and perform a free termite inspection for you. HOW DO I STOP TERMITES? The best way to stop termites is to remove potential food sources and eliminate moisture problems. If you think you might have termites or have noticed any of the conditions or signs listed above, the best way to know for sure is to have one of our trained and state-certified termite inspectors come out for a free inspection and estimate.